François Clouet. 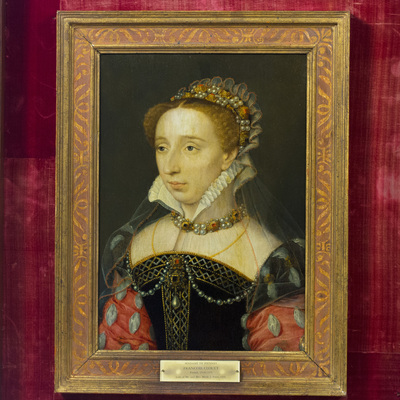 Portrait of Diane of France, Daughter of King Henri II, ca. 1555. Oil on panel. Gift of Merle J. and Emily N. Trees, 1941-1-1. Art history doctoral student Nancy Karrels traveled to Los Angeles in April 2016 to present her research at a WWII-era provenance roundtable at the Getty Research Institute. For several years, Nancy has studied the fate of works of art looted in Europe by the Nazi regime and worked with museums and governments to verify the provenance of their collections. Since beginning her studies at the University of Illinois at Urbana-Champaign, Nancy has researched the history of ownership of the European paintings collection at the Krannert Art Museum under the guidance of Maureen Warren, Curator of European and American Art. With the assistance of the Department of Art History and the Program for Jewish Culture and Society, Nancy completed several days of research in the rich special collections of the Getty Research Institute. She formed important professional relationships with leading American provenance researchers who are working together to resolve lingering questions about looted art in American museums for the benefit of Nazi victims and the museum community. Thus far, Karrels has established the legitimate ownership history of a number of paintings at the Krannert Art Museum, including the sixteenth century Portrait of Diane of France, Daughter of King Henry II by François Clouet and the seventeenth century Christ after the Flagellation by Bartolomeo Esteban Murillo, a founding work of the museum currently on view in the Trees Gallery. To further her work at the museum, Karrels was recently selected to participate in a German-American provenance research exchange program sponsored by German government agencies. The program consists of two weeklong workshops attended by experienced provenance researchers from each country and will take place in New York and Berlin in 2017. In addition, Karrels will curate the upcoming exhibition at Krannert Art Museum Provenance: A Forensic History of Art. The exhibition draws from her current work at KAM in order to "explore diverse facets of provenance research, including geneology, documentation, the idenfication of marks and labels, and attribution." Provenance: A Forensic History of Art will be on view in the Kinkead Gallery from May 13, 2017 through June 2018.